The Iraqi Council of Representatives (CoR) passed a law on November 26 that solidifies the Popular Mobilization, the majority of which are Shi’a militias with a history of sectarian violence, as a permanent security institution in Iraq. The Popular Mobilization Act, passed primarily through the efforts of Shi’a and Kurdish parties, grants qualified Popular Mobilization Units the same rights and financial benefits as members of the Iraqi Security Forces (ISF). Sunni political leaders and parties, however, rejected the law as a serious blow against national reconciliation efforts and called for its reversal. The law’s current language does not address the structure of this new security institution or clarify which Popular Mobilization units, which includes several Sunni units, would be inducted into it. As it stands, the CoR will need to pass successive laws or amendments regarding the Popular Mobilization’s structure, raising a concern that the Shi’a parties’ dominance in the CoR will sway the structure to favor Shi’a militias. The law could benefit Sunnis if it legitimizes the use of local Sunni militias and tribal forces as security forces in majority Sunni provinces, thereby acting as an alternative to the National Guard Law, a key piece of legislation which Sunnis sought as reconciliation efforts but Shi’a parties blocked. National Alliance chairman Ammar al-Hakim and Sadrist Trend leader Muqtada al-Sadr both called for the form of the Popular Mobilization to be non-partisan and inclusive, but sectarian Iranian proxy militias, who already dominate both the PMUs’ leadership and the CoR, are positioned to benefit from the law the most. A legitimized Popular Mobilization will result in a sectarian security force funded by the Iraqi government but responsive to Iranian advisers, which will further alienate Sunnis from the Iraqi Government. Iraq stood on the brink of a Sunni insurgency in late 2013 before ISIS began to seize terrain because former Iraqi PM Nouri al-Maliki reversed the gains of the previous U.S.-led Coalition to reconcile and reintegrate Sunni Arabs into Iraqi politics in 2008. Maliki launched a highly sectarian policy to marginalize Sunni politicians and consolidate control over the Iraqi military the day U.S. forces withdrew. His political actions ignited a year-long Sunni anti-government protest movement that erupted in January 2013 after the near arrest of Rafi al-Issawi, the moderate Sunni Finance Minister, in December 2012. Sunni infighting crippled the Sunni political base in 2013, making it unable to channel or mitigate growing Sunni discontent away from an insurgency. Maliki’s maneuverings compounded these internal fractures, leading to the erosion of the Sunni political alliance, Iraqiyya, throughout 2012. Iraqiyya further split over how to handle Maliki’s administration: Issawi led a boycott of Maliki’s cabinet in January 2013 in solidarity with protests but several Sunni leaders broke rank and returned in March in favor of negotiation. The Sunni political alliance was effectively dead before the June 2013 provincial elections in Ninewa and Anbar Provinces, leaving the protest without an effective channel to a political resolution. Clashes between the government and protesters kindled the growing insurgency and ultimately created the opening for ISIS’s capture of Fallujah in January 2014. Violent government escalations against the protest movement, such as the April 2013 massacre at the Hawija sit-in protest camp, galvanized the movement. The mass arrest of Sunni males in Baghdad after ISIS attacked the Abu Ghraib and Taji Base prisons in July 2013 heightened grievances. Multiple anti-government organizations competed to champion the Sunni cause, harness their discontent, and facilitate a full insurgency. Chief among these competitors was ISIS, rebranded from al Qaeda in Iraq (AQI). Sunni Arabs had rejected ISIS’s predecessor, AQI, and joined the Iraqi Government to defeat it in the Sahwa, or Awakening, movement from 2006 to 2008. ISIS resurged in parallel with the anti-government protest movement and conducted a Vehicle-Borne IED (VBIED) wave campaign in 2012-2013 targeting Shi’a civilians to spark a sectarian civil war that would break the Iraqi state. ISIS’s black flags were present within the protest camps in Ramadi starting in October 2013. AQI’s resurgence and its presence in previously off-limits camps demonstrates that Iraq’s Sunni Arab population became willing to tolerate ISIS’s presence in their midst despite the earlier expulsion of AQI, indicating the virulence of their anti-government sentiment. ISIS’s presence in the camps suggests that ISIS cooperated on some level with other anti-government insurgent organizations that had been present in the protest camps. Jaysh Rijal al-Tariqa al-Naqshbandia (JRTN), a neo-Baathist insurgent group, harnessed the 2013 protest movement directly in order to stoke its own insurgency. JRTN infused the anti-government protest movement with revolutionary rhetoric and traditional Baathist branding. ISIS likely relied on its support to infiltrate the protest camps. Other legacy revolutionary groups, such as the 1920 Brigades, another neo-Ba’athist group, and Ansar al-Islam, a Kurdish Sunni insurgent group, re-emerged as well prior to December 2013. Saddam-era Iraqi Army officers made up the core of JRTN and the 1920 Brigade’s manpower and lent military know-how and leadership to the groups. This experience with military organization and knowledge of the terrain made each neo-Baathist group a formidable rival to ISIS. Maliki’s order for the Iraqi Security Forces (ISF) to clear the sit-in protest camp in December spurred the development of an organized Sunni rebellion. 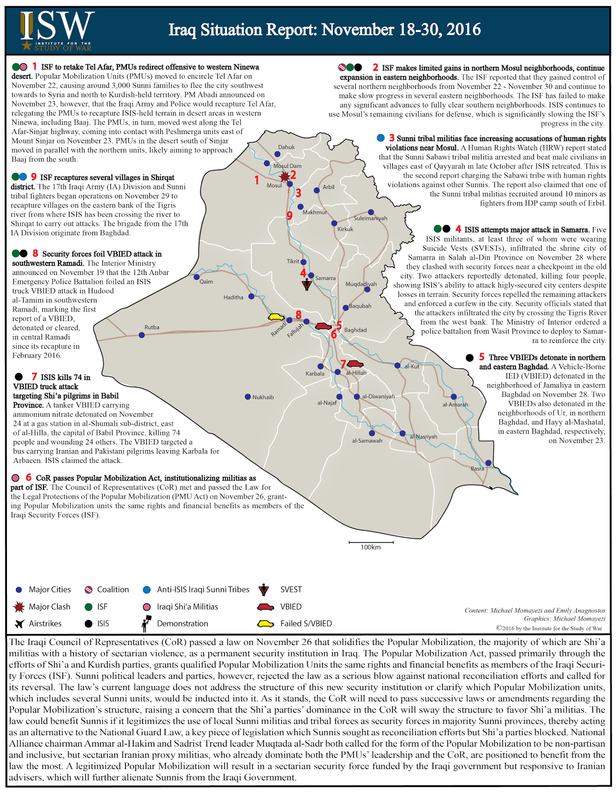 The large scale clashes on December 30-31, 2013 between protesters and the ISF in Ramadi signaled the start of an insurgency. The General Military Council of Iraqi Revolutionaries (GMCIR) formed in January 2014 as an umbrella to absorb recently-formed local military councils in majority Sunni areas including Anbar, Fallujah, Mosul, Salah al-Din, Kirkuk, Baghdad, and Diyala. The GMCIR formed as ISIS seized control of Fallujah on January 3, but it reflected the degree of preparation by JRTN over the preceding year to cultivate a Sunni insurgency. Another umbrella organization, the Council of Revolutionaries of the Tribes of Anbar (CRTA), also formed in January 2014 in response to the clearing of the Ramadi protest camp. JRTN supported ISIS’s rise because ISIS could further the anti-government cause. JRTN and GMCIR leader Izzat al-Douri, a top Saddam-era deputy, acknowledged on July 17, 2014, following ISIS’s first northern offensive, that ISIS “helped the revolutionaries achieve their goals and were semi-[parallel] with them in facing the Iranian Safavid project in Iraq.” These leaders, nonetheless, remained wary of ISIS’s adherence to their brand of an anti-government but pan-Iraqi insurgency: CRTA leader, Sheikh Ali Hatem, warned jihadists from taking advantage of the revolution in his formation statement on January 3, 2014. The cooperation between ISIS and JRTN over the insurgency came to end likely by the fall of 2014 at which point ISIS began to brutally marginalize and suppress JRTN. JRTN ceased to support ISIS’s means of carrying out the insurgent: JRTN criticized ISIS openly in August 2014 after ISIS targeted Yazidis in Sinjar while the GMCIR, in which JRTN played a dominant role, criticized ISIS for taking the “revolution to a different path” and continuing north, rather than overthrowing the government in Baghdad. In turn, ISIS began to consider JRTN a competitor, especially as JRTN frequently tried to impose its own governance in overlapping territory. In response, ISIS began to systematically assassinate retired Iraqi Army officers, JRTN’s primarily recruitment pool, in Mosul in September 2014, a sign that it had begun to eliminate organized military resistance as a solution to the dispute. ISIS's military dominance forced JRTN to go to ground. Contemporary U.S.-led Coalition operations to degrade and disrupt ISIS in 2016 may unlock the Sunni insurgency that began as the GMCIR, CRTA, and other smaller groups. This outcome will transpire if conditions are not set to help Sunni Arabs in Iraq to address their original and mounting grievances. The Coalition has attempted to pursue Sunni reconciliation politically in Baghdad, including through a National Guard Law aimed to provide Sunni communities with a local security structure. These lines of effort largely failed because of efforts by Iranian proxies and pro-Iranian political groups. The U.S. and Iraqi Governments are unlikely to be able to address the grievances in 2016, as the Prime Minister Haidar al-Abadi government faces continued pressure from sectarian political and militia leaders to maintain the Shi’a-dominated status quo. These leaders could further Sunni distrust in the government. The Iraqi parliament passed the controversial Popular Mobilization Act on November 26, which institutionalizes the Popular Mobilization Units, the bulk of which are Shi’a militias, as part of the ISF. Sunni political leaders boycotted the vote, warning that the law hurt national reconciliation efforts. The law, the language of which remains open-ended, could support local Sunni security forces by ensuring that they are equally integrated into the new structure. However, Shi’a parties already rebuffed conditions by Sunni parties to increase the number of Sunni units, suggesting that Shi’a militias, including those charged with sectarian violence, will dominate the future structure of the Popular Mobilization. Meanwhile, former PM Maliki is carving a path to return to the premiership, which would further alienate Sunni Arabs in Iraq from the central government. His intermediate efforts have already resulted in changes that are marginalizing Sunnis, including his facilitation of the dismissal of Sunni Defense Minister Khalid al-Obeidi on August 25. This dismissal highlighted the division among Sunni parties in the government, undermining potential Sunni political unity. Sunni political infighting has also emerged on the provincial level ahead of provincial elections. These elections are scheduled for April 2017, but the financial crisis could result in its merger with the 2018 parliamentary elections. The Anbar Provincial Government has made repeated attempts to oust its governor over allegations of corruption and mishandling the return of Internally Displaced Persons (IDPs). The Anbar Provincial Court also issued on October 16 an arrest warrant for Ahmed Abu Risha, who in 2007 succeeded his brother, who was assassinated by AQI, as the leader of the Sunni Awakening, or Sahwa, movement in Anbar that helped the U.S. defeat AQI. The legacy Sahwa elements subsequently resisted ISIS’s first attempt to retake Ramadi in January 2014. A similar dynamic is re-emerging in Salah al-Din Province: the Sunni Jubur tribe dominates local politics, but the tribe is divided on policy, including its relations with Shi’a militias, which constitute a large portion of the security force in Salah al-Din, and the return of IDPs. The divide has resulted in the governorship swapping between the rival branches of the Jubur tribe. This continuous jostling over governance and security arrangements can lend to instability in the province. This divide also appears in federal politics; recently, one Jubur parliamentary member called for the dismissal of Salim al-Juburi, the parliamentary speaker. In Ninewa Province, Sunni Arabs are displaced during anti-ISIS operations, then prevented from returning to villages that Kurdish forces have secured. Sunni Arabs could also be shut out of the post-ISIS administration of Ninewa Province if Shi’a and Kurdish parties dominate security. The failure to create secure, stable and effective local governance could drive Sunni populations to seek alternative ways to protect themselves and redress their grievances, opening avenues for insurgent groups to infiltrate. Sunnis also remain at odds with each other and these intra-Sunni confrontations are already creating opportunities for Sunni insurgents. Unidentified tribal leaders in Ramadi have reportedly allowed the return of known ISIS militants into the city, only months after its recapture by the ISF in January 2016. Suicide attacks in Fallujah in November 2016 suggest that ISIS has already reconsolidated its networks in the city, which was cleared in June, or found residents that remain tolerant to its ideology. Meanwhile, Sunni tribes have carried out violent reprisals on other Sunni civilians who lived in recaptured ISIS-held towns, accusing those civilians off collaborating with ISIS. These divides within Sunni communities will prevent local, national, and political Sunni unity, and will require the same scale of neighborhood-by-neighborhood Sunni reconciliation efforts that U.S. forces carried out in 2007. JRTN’s rhetorical resurgence has already begun. JRTN is seeking to demonstrate that it is the best champion for Sunnis in Iraq over the alternatives of ISIS and the Iraqi Government. JRTN is setting conditions to take immediate advantage of ISIS’s loss in Mosul in order to reclaim the city and its networks. The group issued a statement on October 17, the day Coalition forces launched operations against ISIS in Mosul, claiming to have attacked ISIS in Mosul and calling for additional resistance against ISIS. ISIS has been systematically imprisoning or killing civilians and retired Iraqi Army officers who refuse to act as human shields, an indication both that resistance to ISIS is mounting and that ISIS is attempting to decapitate it. Meanwhile, JRTN has continued to criticize ISIS’s methods, including issuing a statement against an ISIS attack at the Prophet’s Mosque in Saudi Arabia in early July, in order to show itself as kinder, more reasonable champion for Iraqi Sunnis. JRTN and its allies are tapping into Sunni disillusionment with the Shi’a-dominated government in order to demonstrate that they are the best alternative for Sunnis. JRTN’s statements on October 15 and 17 rejected any Shi’a militia presence in the city and criticized Iranian presence in Iraq, indicating that JRTN is positioning itself to inherit ISIS’s mantle of Sunni resistance against the government. The GMCIR, on behalf of all armed groups including JRTN, issued a similar statement on October 16 criticizing the Iranian occupation of Ninewa as a way to carry out a “demographic change in Iraq and the region.” The 1920s Brigade warned on November 3 against the presence of Shi’a militias in Mosul during anti-ISIS operations. These statements underscore that JRTN and other insurgent groups are playing on concerns that the Iraqi Government will not be able to protect Sunnis from the Shi’a militias or ISIS. JRTN’s resurgence will have other indicators. JRTN’s signature attack is a targeted assassination from a moving vehicle. Recent reports of drive-by shootings targeting ISIS militants in Mosul likely indicate that JRTN is already on the rebound. Sunni insurgents, particularly JRTN, also have run extensive IED campaigns in the past. Indicators of JRTN resurgence will therefore likely include assassinations of Iraqi security officials, particularly Popular Mobilization elements in charge of securing refugee camps and recaptured areas; IEDs along major roads targeting ISF access to key terrain in northern and western Iraq; and recruitment within the ISF. JRTN will likely recruit more successfully than ISIS among Iraq’s Sunni Arabs in 2016-2017 because ISIS re-invigorated the blood feud and also lost its control over Sunni Arab populations. ISIS will attempt to limit JRTN’s opportunities to resurge by eliminating current JRTN members and possible recruitment pools from among civilians and former ISF officials. ISIS has already executed hundreds of former police and army officers before withdrawing from cities south of Mosul. These efforts will likely lead to increased violence inside Sunni majority areas and places where Sunni IDPs are aggregating, including Kirkuk and Tikrit. Al Qaeda in Syria is also positioning to unify disparate Sunni Arab factions in Iraq and gain popular support in the wake of ISIS. AQ seeks to perform the role of the silent vanguard of Sunni insurgencies, and it will enter Iraq with a low signature to evade the Coalition. AQ may even partner with JRTN the way ISIS did before and just after ISIS broke from al Qaeda to build a network of Sunni insurgent groups in Iraq to which AQ can preach. Al Qaeda leader Ayman al-Zawahiri called on Sunnis globally to resist the “Safavid-Crusader” occupation of Iraq in a speech released on August 25, 2016, in which he called for Iraqi Sunnis to resume a “long guerrilla warfare” in the face of territorial losses and urged AQ in Syria to support this rebuilding process in Iraq, indicating al Qaeda’s intent to reinvigorate and reconstitute a Sunni insurgency against Baghdad. Zawahiri’s call for cross-border relations also suggests that AQ will renew efforts to maintain a unified, single organization across Iraq and Syria, as it tried to do before it split from ISIS in 2014. AQ will likely seek to build its networks on top of pre-existing cells along the Euphrates River Valley in Anbar Province and in Ninewa Province, including in Mosul. AQ will attempt to coopt remnant elements of ISIS that escaped among the flows of IDPs. Attacks in IDP camps, especially in the Euphrates River Valley and Diyala Province, could signal that AQ or JRTN has infiltrated the camps and is seeking recruits. AQ will conduct outreach among ungoverned Sunni Arab populations, by providing religious classes, infrastructure, and utilities if possible. AQ will portray itself as a local Sunni resistance rather than use the AQ brand, which is a liability that AQ leader Aymen al-Zawahiri has already demonstrated he is willing to avoid. AQ’s resurgence in Iraq will therefore be difficult to track and distinguish from active and vocal Sunni mobilization. The establishment of new organized groups of Sunni resistance fighters is a likely indicator that an AQ resurgence is underway. AQ will target IDP camps as well as civilians in ungoverned portions of major cities. The Euphrates River Valley could be AQ’s main line of effort because AQ likely has latent networks there that connect to AQ leadership in Syria. Preventing another Sunni insurgency, particularly one that can be coopted by JRTN and AQ, is a necessary task for the anti-ISIS Coalition. Both JRTN and AQ seek an outcome in Iraq that is antithetical to US interests. Anti-ISIS operations that do not explicitly block AQ and JRTN will instead enable them. The Coalition can prevent another Sunni insurgency if it takes preventative measures that are both military and political. These measures need to include three lines of effort within its current mission: the ISF, IDPs, and Iraqi Government. The Coalition must prepare the ISF in counterinsurgency (COIN) measures, against both the post-Mosul version of ISIS, and resurgent insurgent groups such as JRTN and AQ. Maj. Gen. Gary Volesky, commander of Combined Joint Force-Land Component, stated on October 24 that the ISF will start a new training cycle on COIN to combat an insurgent-like ISIS. These efforts will also need to inure the ISF and tribal militias against AQ and JRTN’s influence. The Coalition will also need to ensure that the IDP camps around Mosul are secured with proper security forces and not with Shi’a militias or compromised ISF units, which could inflame sectarian tensions and lend weight to insurgent ideology. Lastly, the Coalition cannot ensure the defeat of ISIS or any insurgent group without resolving the political conditions that allow it to take root. The Coalition must reinvigorate national reconciliation efforts that have fallen to the wayside. ISIS found initial support from Iraq’s Sunnis because it offered an alternative to the government which many Sunnis saw as oppressive. JRTN and AQ will try to do the same. The Coalition needs to ensure that its lines of effort reconcile Sunnis with the government to the point that Sunnis will use political rather than insurgent means to address grievances. The U.S. will need to decide if and how it remains involved in Iraq after Mosul’s recapture, which will likely occur after President-elect Donald Trump takes office in January 2017. The Iraqi Government may set conditions for the U.S.’s withdrawal in Iraq after Mosul, but the U.S. and Coalition should not pursue an immediate drawdown of military forces themselves. Doing so could result in similar conditions that developed in 2012 and 2013 after the U.S. withdrew completely in 2011. Instead, the U.S. should continue efforts to train and advise the ISF in order to help prevent the reconstitution of insurgent groups and maintain Iraq’s sovereignty. The U.S. and its international partners should also ensure involvement in resettling IDPs and mediating the reconstruction of cities and their local governing structures. Successful resettlement and reconstruction efforts that earn the population’s trust in the Iraqi Government can prevent Salafi Jihadi groups from finding openings to resurge. The U.S. should also help address the underlying issues that fueled the Sunni insurgency and remain active in shaping Iraqi’s political reconciliation efforts and encouraging inclusive governance. The U.S. should have the expectation that it will remain involved in some capacity in Iraq in order to ensure that anti-ISIS gains stick and that it has resolved the conditions that allowed insurgent groups to arise in 2013. Jabhat al Nusra, al Qaeda’s affiliate in Syria, was active along the Euphrates River Valley southeast of Raqqa City before ISIS seized the area in late 2014. Al Qaeda likely retains latent influence with tribes along the Euphrates River Valley that it can use to resurge if ISIS is defeated. These tribes straddle the Iraqi-Syrian border, which can provide al Qaeda with cross-border access to networks in western Iraq.